I bought Bobby’s auto-biography as soon as it was released.He was one of the few people in football who had anything genuinely interesting to say about the game, and more importantly the people involved in the game. Because at its core football is about people- the fans and the players, and their relationship through adversity and success. The mega millions flow into the game and straight out again, but what makes football great has never changed. It’s arguable that Bobby Robson was England’s greatest ever manager.True, Sir Alf Ramsey won the World Cup, but he did so in England at Wembley with the help of a generous Russian linesman. Robson took England to within a penalty kick of the 1990 World Cup final in Italy, losing out to eventual champions Germany. His club record is even more evidence of his footballing pedigree. Success in Holland,Spain,Portugal and England before a return to his beloved Newcastle United. The owners of the Tyneside club decided Robson’s record of regular top 5 placings with Newcastle wasn’t good enough and removed him in favour of several more ‘fashionable’ names .Hands up anyone who remembers Newcastle’s golden years under Gullit and Dalglish? Precisely.Newcastle’s interminable slide started the day they parted company with Robson.Robson was informed of his sacking while he was watching a youth team game, scouting young talent for the Newcastle youth side. Despite all this his love for the game, and Newcastle United never wavered.Sir John Hall, the former owner of Newcastle,commented he was always late for the start of events because Bobby Robson spent so long talking to fans- not about himself but about the fans and the game.When Hall berated Bobby about this he would just shrug his shoulders and say “you’ve got to talk to the fans”. There’s a lesson there for today’s football aristocracy. 18 February 1933-31st July 2009. George “when I’m cleaning windows” Formby wasn’t born there. Pub punch up specialist Steven Gerrard lives there. The place has lots of Squirrels. Formby FC’s Altcar Road ground has always been a desolate place. The facilities spartan and held together by little more than duct tape and hope.The pitch invaded by tumbleweed from the adjacent bleak farm land and the wind, blown straight from the Irish sea with hobnailed boots on. So it’s a nice surprise to see pristine new facilities a newly laid pitch and bright sunshine for the visit of Cables.Or should I say the ‘New Cables’. In the space of a week Cables’ performances have ranged from promising, to pretty good to dire. The home match against St Helens on Tuesday was definitely more Steve McLaren than Fabio Cappello.Still, early days, players getting to know each other and all that. Tea: a cup of tea at Formby FC costs £1. Yes, amazing isn’t it? One tea bag and a spoonful of milk. No wonder only footballers can afford to live here.Sort it out!! Several of the players from Tuesday’s debacle have been thrown overboard as being surplus to requirements and a couple of new faces have arrived for tonight’s game.The players themselves seem suitably chastened by Tuesday’s experience which is good to see. As the players are warming up Formby officials are still marking the pitch out – dodging loose shots as they dab whitwash onto the penalty spot. Apparently it’s all hands to the pump to get things ready for the season and it shows.Someone was still assembling a chair when I entered the changing rooms and advised me ‘not to sit on it yet just in case ‘ . The game- starts off a cagey affair, little bit of this and that.Not much in terms of chances.Formby have a couple of pops, Cables shave the bar with a diving header and win a few corners. Then Cables hand Formby a gift when two defenders conspire to haul down a prowling Formby forward. 1-0 . In keeping with the friendly spirit Formby hand Cables an equaliser as a slack back pass is rammed home by Cables Phil Green. Not to be outdone Cables’ Ian Callahan (looks like Ravanelli-playing like ravioli) slices a cross into his own net.Apparently the pressure of being in the lead is too much for either side. A few minutes later Formby concede a penalty and Josh Mitten steps up to level things up again. For a friendly there’s certainly a lot of bodies lying on the pitch.The sound of boot hitting shinpad comes along at regular intervals. Cables make several changes for the second half and are immediately on the back foot as Formby start to resemble a non league Brazil.Resplendent in their yellow and blue they lay siege to the Cables area with a succession of rapier one touch passing moves.Thankfully a sloppy final ball or a Cables boot prevents the coup de grace, which is just as well because Cables don’t look like making it into the Formby half let alone scoring. Cables lift themselves enough to put some late pressure on the Formy goal.Dave Ridler’s header fizzes inches wide of Formby’s far post and a couple of crisp moves almost produce an opening. The game finishes 2-2 .Not great by any means but better than Tuesday’s disaster and at least Cables are starting to score goals. Next stop Oldham to see Cables play Chadderton- Oh the glamour. Everything is in place. Polished and raring to go, you sit back and await the smooth purr of the engine as you turn the key, and all you hear is a deadening thud as the wheels fall off.Cables first two games had built up a sense of excitement, the fluid movement and smoothness of the football had been a revelation. Less than 20 minutes into tonight’s game we were transported back 12 months as a lumpen Cables side flounder against our lower league neighbours in depressing drizzle. The Hovis- munching brigade had done us again. It appears they only need to turn up at Hope Street and Cables turn into Supermen wearing kryptonite underpants. The 3-1 scoreline could have been a lot worse but for some rash St Helens finishing. Obviously there’s no need to panic or even worry just yet but , like the kid on Xmas morning who gets new pyjamas instead of a PlayStation 3 , there’s the heavy burden of instant and cutting disappointment. I’d unwisely invested some time winding up those from the land of Johnny Vegas ( is the monkey from St Helens too?) on the St Helens Town forum. We’ve not had any reason to be confident in recent months so I ended up like a 14 year old after his very first pint…..dizzy, talking a load of crap then being as sick as a dog. If you are going to plump for a hastily arranged friendly you may as well go for a biggie. I doubt Cables would have picked the mighty AFC Telford as the ideal opponents to continue their preparation for the new season. Still, a game is a game- and it’s another 90 minutes for the new Cables to familiarise with each other. The coach journey down is interminable, mile after mile of crawling traffic ensuring the 3pm kick off is put back to allow for Cables’ estimated late arrival. The Buck’s Head stadium is very impressive by non league standards, all shiny metal and modern conference facilities. Obviously they are not expecting a big Cables following as the away end is closed.Meaning the small band of Cables fans set up home on the far touchline. I’m just about to take a pic as the teams come out when a steward’s face appears in my camera lens and informs me taking pics in the ground is not allowed under ground regulation 41857896524 of sub-sections 426- hogwarts 18 Cup-a-soup restrictions. As I’m putting my cam away the steward explains I should have gone through Cables and got official verification to take pics beforehand. I half expect to be man-handled to a back room placed in an orange jump suit and flown out to Guantanamo Bay for my attempted espionage.As it happens a Telford goal breaks the steward’s train of thought and I manage to escape. Telford’s first goal is simplicity itself.Cables’ old boy Steve Torpey bends a low free kick across the Cables six yard box for an unmarked Cowan to stab home from close range.Despite the set back Cables still display plenty of spark. John Couch and Mick Deakin are particulary impressive as Cables manage to probe Telford’s defence without ever making a break through. Telford is a big town, and like all towns it has its resident numpty.In this case it’s a shaven-headed shirtless individual who takes up residence next to the Cables dug out to heap abuse on the players and manager.Eventually he’s moved on but not before another lengthy exchange with the Cables subs warming up on the touch line.Half time and 1 down. Everyone seems quite content, Telford are getting their work out and Cables are knocking the ball around well. The second spell is less than ten minutes old when Telford’s Steve Torpey slams a beauty high into the Cables net from 25 yards.Nothing much we can do but admire the strike and the former Cables credentials of the scorer. Cables miss a real chance to get back into the game when striker Josh Mitten hammers a drive wide from 12 yards with the goal begging. We spend the second half discussing the merits of the new Cables players and talking with several Telford fans who have taken it upon themselves to support Cables. They are generally appreciative of the football Cables are playing and complimentary about several of our players-despite the fact Telford are obviously in 2nd gear. With ten minutes left Cables concede a third from a set piece.Cowan is again allowed time and space in Cables six yard box to head past keeper Andy Brown. That was pretty much game over as far as goal mouth incident went.Cables’ Jacob Baptista had some promising runs at the Telford defence and there were a couple of long range pops at the Telford goal but the game fizzled out. Two games, two defeats but plenty of hope for the coming nine months. Cables fans get their first chance to see the new squad on Tuesday at home to St Helens. New Dawn Fades: Joy Division. Real football fans have two passions, the first is devoting their time and a fair portion of their life to ‘their team’ – usually a pointless exercise on a par with trainspotting.The second is to hope other teams lose.Not every team, just teams who for some reason have wronged you or your club. I’ve always had an illogical hatred for Middlesborough because my old maths teacher was a Middlesborough fan. Mr Mudd, for that was his name, would spend endless hours attempting to make sense of algebra , his frustration at our stupidity would eventually boil over ensuring he would throw the nearest thing to hand at the front row.Being the tallest this usually resulted in my head being a inviting target and a defensive shield for the rest of the class. So Middlesborough it is.Almost certainly irrational- but so is religion if you think about it. Burscough is a club that has never really figured highly in my ‘love or hate ‘ list .They are just there , like that old clump of daffodils in the back garden that poke through the soil in February and vanish in May .Somewhere between Southport and Skelmersdale both geographically and in the football pecking order. When former Cables boss Andy Gray left Prescot for Burscough taking some of our best players- and some of our worst- with him, it immediately catapulted Burscough into the consciousness of most Cables fans. I’d already watched a Burscough side consisting of several reserves and former Cables striker Darren Byers lose 2-1 to Ashton Athletic.I was late for the kick off and could see the ball being hoofed high into the Wigan sky from the Ashton Athletic car park. Uncharitably I thought ” That has to be an Andy Gray side” . As it turned out AG was there but it was the reserve manager who had hold of the reins. It was a scrappy, dour affair with the only piece of real quality served up by Ashton’s number 7 when going on a mazy run before scooping a 25 yard effort over the Burscough keeper for the home side’s first goal. Disappointed to have missed the Burscough first team I earmarked the Burscough game against Everton reserves as my next stopping point.The local West Lancs press assured us this would be a ‘real test’ for Burscough against a strong Everton reserves side. It’s a disappointing crowd at Burscough’s Victoria Park, particularly noticeable is the lack of Everton fans in a crowd of no more than a couple of hundred.The single page team sheet lists no fewer than 28 Burscough players and the Everton side may as well be from Latvia such is the number of total unknowns listed. I’d expected one or two fringe players, in the event it appears to be Everton’s reserve youth team plus a few triallists. “Not much of a turn-out by the Blues, is it?” muses one local as I eye the team sheet . After a short conversation I’m reliably informed Burscough ‘murdered’ Everton 4-1 in the Liverpool Senior Cup last season so expectations are understandably fairly high. A few Burscough players are on the pitch warming up.Instantly recognisable is Phil Cooney and Goalkeeper Zak Jones.Cooney was one of Cables’ few skilful players last season but fell out with Andy Gray when left out of the side and off the bench at the Cables game at Marine on Boxing Day. It was Cables high water mark for the season as Marine were thumped 6-3. Cooney left and Cables season nosedived spectacularly. Keeper Zak Jones was probably responsible for ensuring Cables’ didn’t suffer the embarrassment of several double figure hidings last season.The game at Boston stands out when Zak’s one man rear guard action rescued Cables from a defeat that could have had us in Guinness Book of Records territory. The game starts with former Cables players Byers,McCulloch,Moore and Zak Jones in the Burscough starting line up.None of Everton’s players look to be out of their teens save the goalkeeper. 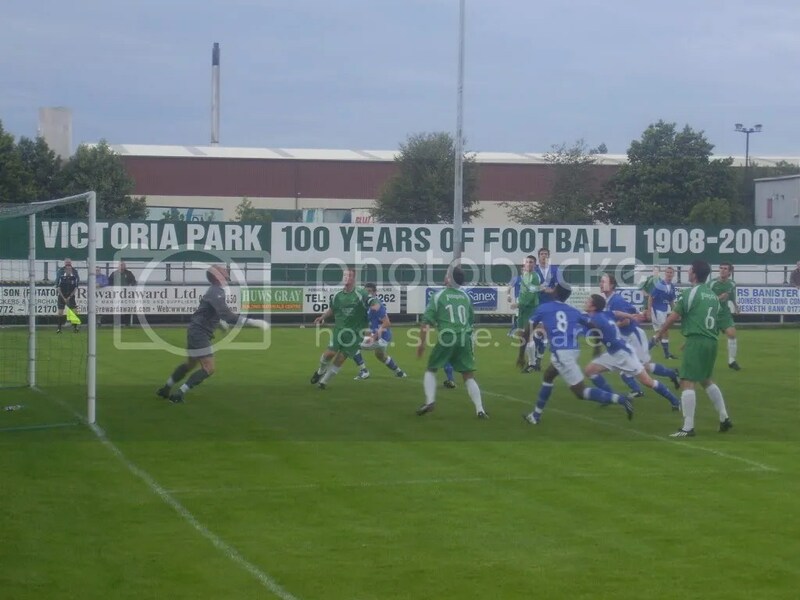 Barely five minutes into the game comes an Everton goal straight from the Cables book of defending 2008/09- a long goal kick bounces straight through the Burscough defence allowing an Everton player to steal in and drill the ball low past a stranded Zak Jones. Burscough rally for a few minutes with Tom Moore playing as striker causing a few problems but the Everton keeper is largely untroubled for the rest of the first half.Byers is a peripheral figure and Jamie McCulloch- a colossus for Cables last year- is largely anonymous. In between keeping Burscough in the game Zak Jones concedes a second as Everton zip the ball across the Burscough goal with lightening speed for a far post tap in. 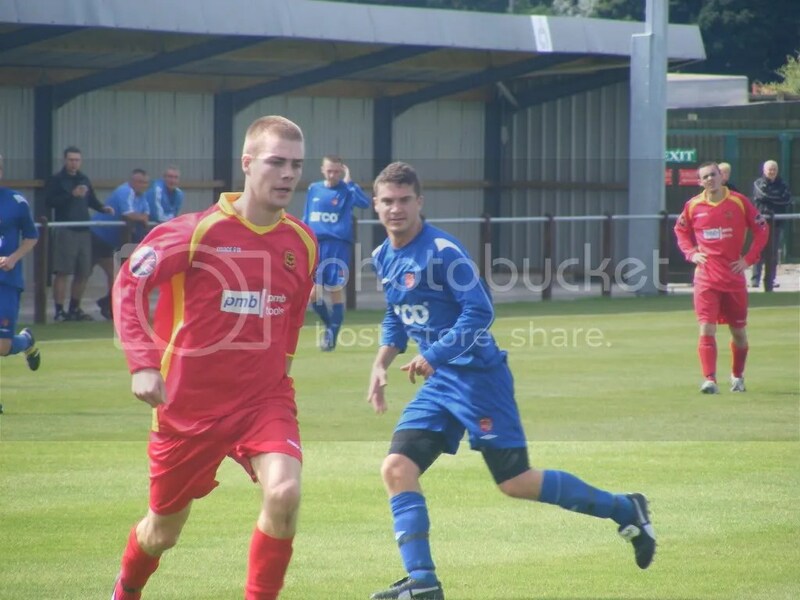 In the seond period Burscough bring on Steve Williams for Darren Byers and also introduce Phil Cooney at right back. A few minutes into the second spell Jamie McCulloch is withdrawn. It’s still a game of bits and pieces with Burscough’s only danger coming from set pieces and Everton squandering chance after chance . Steve Williams gives a pained grimmace and trundles after the ball. It’s probably the most baffling of Cables’ departures to Burscough- quite why Steve Williams, who was the dug out’s whipping boy last season, decided to put himself through it all again is anyone’s guess. Almost certainly his confidence will be drained during the season as surely as your bank account will be plundered should you reply to that Nigerian lottery win e -mail. The poor lad. Everton rap home a third and rattle the woodwork before Burscough pull back a goal from a corner. In the closing minutes Everton add a fourth, hit the post again and warm Zak Jones’ hands a couple of times before the official brings the game to an end. It’s difficult to make a judgement on Burscough having only seen them play twice in the pre season.They do seem to have all the AG traits of an over reliance on set pieces, lack of cutting edge and tactical ‘drift’ . As I’m leaving the ground one Burscough is heaping praise on Zak Jones. “He’s a good keeper that Jones” says one..
“Aye, he’ll need to be” responds his mate. 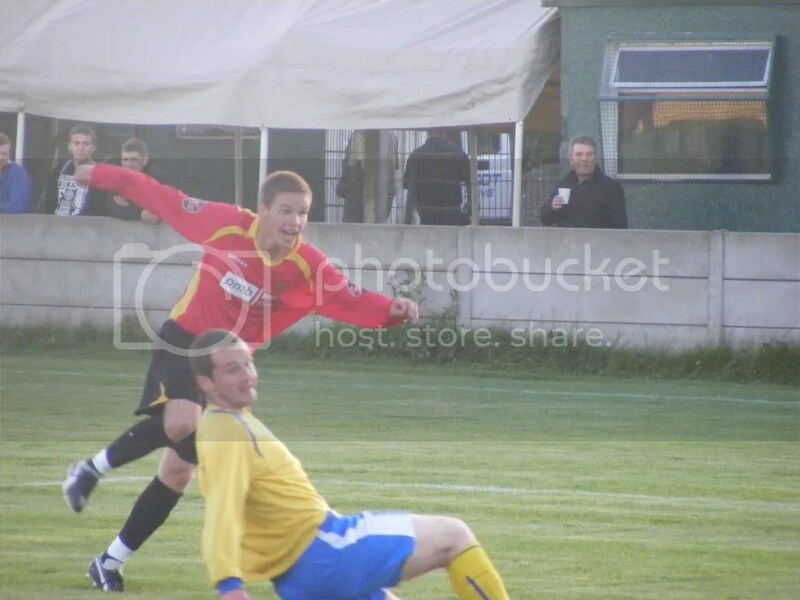 On this evidence Zak will need another season long block booking with his physio to treat chronic back ache. 12.15pm at Hope Street. It’s like the first day of school, lots of nervous looking people hanging around, hands in pockets, not many seem know each other .Those that do know each other flock together in small groups. This is the Cables squad 2009/10 ,the revolution sweeping Cables has carried all before it to such an extent I only know 3 of the 30+ players assembled. This is the cleanest of sweeps ,there hasn’t been such a drastic turnover in personnel since Stalin ordered all his cabinet members murdered or sent to Siberia. Maybe it was needed.Defeat had become a depressing part of the Cables set up last year.It was never a case of if Cables would lose but how many goals Cables would ship. If nothing else a desire to impress the new manager should ensure this set of Cables hopefuls will at least give it their all. Stone Dominoes- is it a 1960s skiffle group or is it a pizza? Sadly not, as playing either of those two might just ensure Cables first Saturday win in well over 15 months. The Dominoes are an up and coming club from Staffordshire. Only formed in 1987 they take their name from St Dominics, yes it sounds a bit silly but it stuck- and let’s be honest is more original than all the ‘Towns’ and ‘Athletics’ out there. It’s a bit of a drive- 60 miles to be exact, with a lay by stop over in Stoke to make sure no stragglers have their maps upside down.The Stone set up is very impressive for a North West Counties club. Several pitches, a decent club house and the main pitch having a playing surface to rival a premiership club’s. The only down side is the Cables dressing room which appears to have been designed for a 5 a side team- with 17 Cables players, the management and kit man squeezed inside it resembles the Tokyo underground at rush hour.Toes are being stepped on, elbows rammed in ribs as everyone struggles for six inches of space. With a Cables reserves side and the first team playing matches here its a bit of a wait to find out who is turning out for who.As it happens I only recognise Lee Owens and Andy Paxton from last year’s Cables squad in today’s first team. Just in case Cables are expecting a walk over a Stone official tells me the Dominoes won 16 of their last 17 league games last year. As runs go it’s nearly as impressive as Cables 20 league games without a win. The game starts and amazingly Cables are instantly into a slick passing game.The keeper rolls the ball out to the full backs who roll it inside to the centre backs, then into the midfield, who ping the ball around with one touch aplomb before delivering precise through balls for the forwards to run on to. 5 minutes in and Cables have already squandered two good chances as the Dominoes are struggling to get the ball out of their own half. Every Cables player looks comfortable in possession and tellingly they all want the ball.It’s a refreshing change from the sore necks we developed watching Cables over the past two years. Eventually Stone get a foothold in the game, Prescot’s Paxton makes a good near post save but Stone carve out a goal with an intricate passing move in the box.For the rest of the half it’s pretty much Cables pressure with a combination of slack finishing, near misses and an alert Stone keeper keeping the visitors at bay. At half time the several Cables fans compare notes, there’s general agreement about the quality of the football and the basics being right- talking to each other and movement off the ball.We try to put names to shirts to gather info on the best players on show- Couch,Connell and Callaghan- all players the manager has bought from Winsford have caught the eye. We ask who the left back is and are amazed to find out it’s young Karl Carney, a player who appeared briefly for Cables last year before vanishing without trace.He looks transformed. Cables make a few changes at half time and continue to create chances, a couple of one-on-one with the Stone keeper go begging before Stone are awarded a soft penalty-which is duly converted.A minute later Cables rattle the Stone upright and the Stone keeper pulls off a blinding one handed stop from a rasping drive from 18 yards. Any chance of Cables snatching a draw is ended when Stone score a comedy third.The Cables keeper Ian Lowe rushes from his six yard area to intercept an innocuous looking bouncing ball.Lowe leaps to head the ball but it loops about 6 foot over his head allowing a Stone player to run in a tap the ball over the line. In fairness even the Cables followers can’t stifle a chuckle at the bizarre nature of the goal. And that was pretty much it. It was Stone’s fourth pre season game and Cables’ first.The signs of rustiness were very apparent in the finishing no question, but the football was light years away from the sterile long ball game Cables fans have become accustomed to.It was only later talking about the game we realised not a single aimless long ball had been played by a Cables outfield player.The ex-Winsford players on view certainly appear up to the task and with a few more games to iron out the creases the results should come.